The prayers start at midnight with the fireworks shot from the top of Hodosan (Mt. Hodo). A bonfire is lit in the shrine precincts and many people come for hatsumoude (first visit to Shrine in the new year). Kagura (Shinto music and dance) is performed at kaguraden (the shrine hall for kagura). The event is held every day from January 1st to 15th. Visitors from afar attend the festival. Toshiotoko and Toshionna (men and women who were born in the year with the same sign of the Chinese zodiac) throw beans in ceremonial costume. In front of Honden (the main shrine), hikime shinji is practiced, where the priest shoots off arrows towards the east, west, north, south, to exorcize the bad spirits and bring in good fortune. People who pick up an arrow shot by the priest are believed to have good fortune in the year ahead. 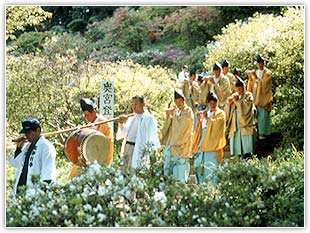 The event is held to celebrate the day Emperor Jimmu founded Japan as an independent nation and became the first emperor of the country. There is a cultural lecture, which is open to the public. Prayers are given to Hodosan deity for “minori” (growth and success) in agriculture and all other industrial sectors. This is the most important festival held at the shrine. Kenpeishi (a messenger bearing offerings) is welcomed at 10:00am and a solemn festival is held. In the precincts, local arts such as kagura (Shinto music and dance) and shishimai (lion dance) are performed. There are many stalls along the road leading to the shrine and the road is busy with worshippers and tourists. This festival is held on the day of hachiju-hachiya, the eighty-eighth day from the beginning of spring, and it is a celebration for the origins of the shrine. It is also called tsutsuji matsuri (azalea festival). Mikoshi (portable shrine) carries the divine spirit of Yamatotakeru-no-Mikoto and climbs up to Okumiya at the top of Hodosan. The ceremony is held and kagura is performed. The night before, okariya (a temporary shrine for the deity) is built, kasaboko (kasa float) is made and yoimiya celebration is held. On the day, a celebration is held at okariya. At 5:00pm, mikoshi and kasaboko are carried around the town and the cheerful voices of children and festival music fill the air. Funadama festival is regarded as a summer reminder in Nagatoro. Prayers are given for the safety of the Arakawa River. A festival site is built along the riverside, lanterns are floated on the water and fireworks shot off. The cobblestone streets are filled with people enjoying the summer scenes and the atmosphere of Nagatoro. This is a festival to thank the deities of Hodosan for the year&apos;s harvest. Newly harvested rice is offered and ceremonies are held. Oharae (great purification ceremony) takes place to cast out the sins and evil spirits while prayers are given for the peace and health of the present year and to pray for peace and health in the coming year. The 7th of the month April to September／5:30am, October to March／6:00am at Hodosan Shrine. The 15th of the month 3:00pm at Hougyoku-Inari Shrine. This is a unique festival for this shrine. It&apos;s related to the origins of the shrine. 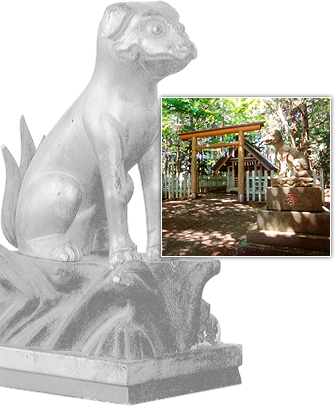 Rice is cooked by imibi (sacred fire) and offered to oinusama (the dog deity) which is a messenger of enshrined Gods. It is held at Hodosan Shrine in the early morning on the 7th of the month. White rice is cooked and offered to the main shrine and to Okumiya (inner shrine) at the top of the mountain. At Hougyoku-Inari Shrine, it is held on the 15th of the month and, instead of white rice, azuki red bean rice is cooked and offered.